WOW, it's been a L-O-N-G time since we attended one of Bill and Linda Lane's photography workshops! As near as I can determine it was back on 2009. What drew us to this particular Nature's Image Photography Workshop was the prospect of staying in one of the Cass Scenic Railroad State Park historic company houses. Houses in the village emulate the 1940's with wooden walkways, etc. Of course there is something to be said for the motivation provided by Bill that gets us up at the crack of dawn to get out and take some pictures. Something we just don't get around to doing on our own. About 15 of us converged on Cass for the workshop which began on a Wednesday night with a "Company House" assignment, some introductions, a presentation by Bill, and logistics for the next couple days. Thursday and Friday involved gathering for a lite breakfast at 5am then heading out, caravan style, to various shooting locations. A stop for lunch, a few bio-breaks, and more locations. Each location provided an opportunity to work on composition and exposure. In addition, Kathy and I found ourselves discovering some camera capabilities we were not aware of or, at least, have not had the opportunity to experiment with. All of our shooting locations involved old barns and, in some places, a few wildflowers. It should be noted, that we deviated from the barn and wildflower routine on Saturday morning. 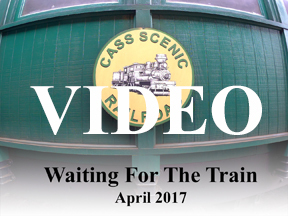 A rail fan group was in Cass and one of their steam locomotives was put into service. We simply couldn't miss taking pictures of it. One thing that always amazes at these workshops is how a group of people can be at the same place and at the same time and come away with some different perspectives. This is certainly the case when comparing our images. Please Note: Click on any image for more specific information about it. All of our images have been "geotagged" so clicking on the little map will bring up a satellite image showing where we were when the image was taken. Camera setting information can also be found. The mid day sun was perfect for some infrared photography. A technical word about these infrared images. The camera was modified to 720nm. Original images have a kind of yellow cast and "Channel Swapping" is used to get the blue cast in these images.